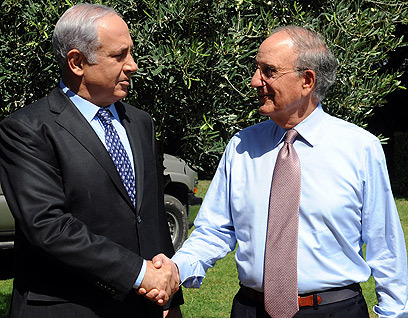 Committed to peace despite obstacles: Prime Minister Benjamin Netanyahu met Wednesday with US special envoy George Mitchell, who arrived in Israel in a bid to save the peace talks following the end of the settlement construction freeze. The two officials were forced to deal with another issue – Foreign Minister Avigdor Lieberman's UN General Assembly address on Tuesday, in which he mentioned his land exchange plan and said that it could "take decades" to reach a comprehensive peace agreement with the Palestinians. There are a lot of doubts and obstacles on the road to peace, Netanyahu said during the meeting with Mitchell, but there is only one way to guarantee that we don't achieve peace – and that is not trying to achieve peace. "I am committed and the government is committed to reaching a peace agreement that will preserve the security and vital interests of the State of Israel. We are committed to following this path," the prime minister was quoted as saying. Netanyahu added that he planned to continue the direct negotiations with the Palestinians, although meeting between the leaders have been suspended until the Arab League conference on October 4. "I hope the good talks that began with (Palestinian President Mahmoud Abbas) will continue without interruption so that we can try to achieve this goal," the prime minister said. "This is the policy I am leading, the policy of the State of Israel – to try to move forward in the path of peace and security." Senator Mitchell noted that US President Barack Obama was "more determined than ever" to achieve Middle East peace. Mitchell, a joint statement said, told Netanyahu that Obama and Secretary of State Hillary Clinton asked him to deliver a message to Israelis and Palestinians assuring them of their commitment to achieving comprehensive peace in the Middle East. "Mitchell noted that he knows there will be many bumps along the road but they (Obama and Clinton) are more determined than ever to achieve the common goal of a Middle East with peace and security," the statement said. See all talkbacks "Netanyahu to US: I'm leading Israel's policy "